The Saga of the recreation of this Film Prop. Our goal was to recreate this prop as completely and accurately as possible. We set out to do it completely right. The underlying research was done by a team of two, Phil Steinschneider and yours truly, Richard Coyle  with a late addition and many contributions by Craig Kovach. Phil and I had many talks about this prop at the outset to nail down what we really knew. With my inside information that the original concealed a 5-shot revolver for the pyrotechnics seen on screen, quite possibly a Smith and Wesson 38, the hunt was on. 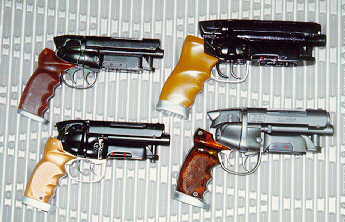 Armed with a screen capture print of the blaster from the scene where Deckard drops his gun onto the street outside Sebastians apartment, Phil visited several gun shops searching for the right gun. When he showed this scene shot to his gunsmith, Sandy Garret of Northern Virginia Gun Works, Inc., Mr. Garrett immediately spotted the details of a Charter Arms model Bulldog .44 special. When Phil showed me pictures of a Bulldog I, too, knew we had finally found the correct hand gun: the triggers, the frame around the triggers, the removable trigger guard and hand grip frame, the cylinder swing out arm, the cylinder thumb latch, and the cartridge retainer and ramp for the cylinder latch pin  all matched perfectly. 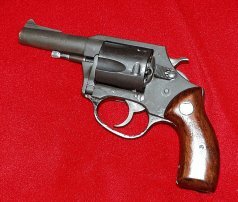 Phil located and purchased a Charter Arms Bulldog .44 revolver and a Steyr-Mannlicher Model SL rifle that were used to pull molds and create master patterns for the project. The Steyr required barrel removal by an expert gunsmith, courtesy of Sandy Garrett at North Virginia Gun Works.